Fasciolosis is a disease caused by two parasites called Fasciola hepatica and F. gigantica, which belong to the class of Trematoda. 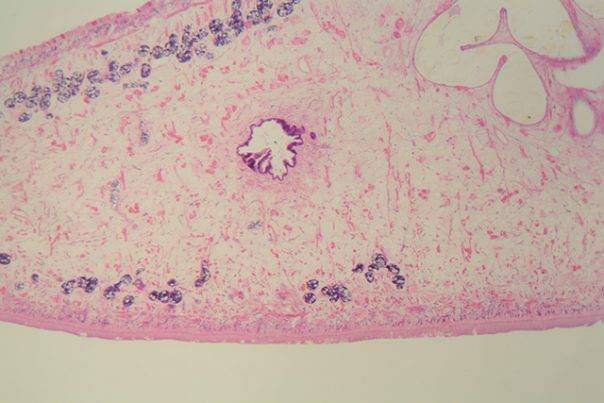 F. hepatica is also known as “the common liver fluke” or “the sheep liver fluke.” People typically become infected by eating raw watercress or other water plants that are contaminated with immature parasite larvae. The immature larval flukes migrate through the intestinal wall, the abdominal cavity, and the liver tissue, into the bile ducts, where they develop into mature adult flukes that produce eggs. The definitive hosts of the parasites are sheep, cattle, and goats. Other alternate herbivore hosts include horses, pigs, buffaloes, donkeys, and pigs. There are two phases of infection – acute and chronic. The acute phase lasts for two to four months and starts when the immature worms penetrate the intestinal wall and the peritoneum, while the chronic phase starts when the worms reach the bile ducts and start producing eggs. There are several known side effects of fasciolosis. Acute infection causes abdominal pain, hepatomegaly, nausea, vomiting, intermittent fever, urticaria, eosinophilia, malaise, and weight loss because of liver damage. On the other hand, chronic infection may either not show any symptoms or may lead to intermittent abdominal pain, cholelithiasis, cholangitis, obstructive jaundice, or pancreatitis. Furthermore, a heavy infection can cause sclerosing cholangitis and biliary cirrhosis. Ectopic lesions may also develop in the intestinal wall, lungs, or other body organs. The main body system harmed by fasciolosis is the immune system as it is an infection caused by parasites. The infection also harms the digestive and respiratory systems. There is no information on what foods or nutrients prevent fasciolosis. However, there are preventive measures that can be done, which include: washing water-grown vegetables with six percent vinegar or potassium permanganate for five to 10 minutes, thoroughly cooking water-grown vegetables, and avoiding sewage contamination of growing areas. The treatment option for fasciolosis includes taking medications that can help kill both the immature and adult parasitic worms. Fasciolosis is a foodborne and waterborne parasitic infection caused by parasites F. hepatica and F. gigantica. Acute fasciolosis causes abdominal pain, hepatomegaly, nausea, vomiting, intermittent fever, urticaria, eosinophilia, malaise, and weight loss as a result of liver damage. Chronic fasciolosis may either not show any symptoms or may lead to intermittent abdominal pain, cholelithiasis, cholangitis, obstructive jaundice, or pancreatitis. Heavy infection causes sclerosing cholangitis, biliary cirrhosis, and ectopic lesions in the intestinal wall, lungs, or other body organs. Fasciolosis harms the immune, digestive, and respiratory system. Fasciolosis can be treated with medications that help kill the parasites.